The second poster was revealed today as a Locke centric piece. Many thanks to all the people that went down to the store today to find out what was going on and to send us back information. This is all made more interesting by having real people at the events. A special mention has to go to Eugene and Mary for all the updates via Twitter. This took us to the new poster site http://thatandbasketweaving.com where the new poster is now for sale. 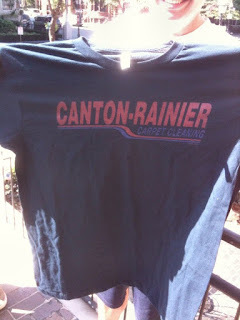 Also given away was this T-Shirt, it shows the logo for Canton-Rainier Carpet Cleaning, Canton Rainier was seen in a season 5 episode. Memphish I agree and am glad that you like W-13 too. The characters are fleshing out well, and the two main ones are coming close to a Mulder/Scully kind of repartee and commeraderie that I really enjoy. Not to mention that the guy is as funny as heck! We'll check the site out Anonymous, thanks! 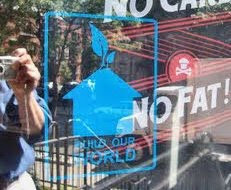 I was trying to figure out why there was a Build Our World sticker on the door, and I've found a BuilOurWorld.ORG site. Seems to be an Irish Gig promotion website, one of the bands playing soon is "Abbadon Incarnate"
I'm fairl;y sure there is no link here but you never know. You have to check everything just in case. Wow, I like how you put all the posters along the top of the front page Zort, nice work! Thanks for all your hard work, Zort! You sum up things very nicely. Very appreciated! The posters and the boards and whatever else they'll be offering as this thing goes along are all fantastic, but I don't think that's where this ends. There are hints leading us to the locations of the promos, but in addition I bet there are hints buried somewhere among all this that will help us understand where next season is going. Haven't a clue yet though. One thing that I noticed at the store today and you can tell in the pic if you look close: the 'd' is crooked, purposefully so. Zort's link shows no crooked D on Sayid's shirt. Could be something ... could be nothing. Maybe in the end all of the clues will point to something. But seeing as we have only had two frames so far, we may need to wait until we get more to see if there is a connection between them all. I think that they may definitely be giving us some S6 clues in all this. Or at least S6 info- kind of like we got with Find815. We'd get a name or an address, some vague piece of info that made no sense at the time, but once the season started we were excited to realize where the pieces of info fit in. And remember at the very end of Find815 they gave us the underwater "news" footage of the wreckage of 815 and then they showed that in the first epi of S4...so maybe whatever is in frame 16 will bear some great significance to the beginning of S6 (?). Scoutpost: You are right. Maybe when we start watching S6 we will think back to some of these things and a lightbulb will go off when we realize that these things meant something. We have been sent an email from Jim W, he says that he ordered the Hurley print and apparently his was the first order so he also got a Damon Carlton and a Polar Bear print as well. I've read that article before. Was that posted here by someone else too, or was it posted in another forum? I can't remember. I see it has been posted at Dark's forum this morning. But I seen this article a day or two ago but can't remember where or when I seen the link. My memeory is driving me crazy. I've only been here and at Dark's recently. Maybe it was on Dark's main page before it showed up in the forum. I was looking at his main page the other day. wheeh (sp)(wipes brow) :). I'm not sure if it has been posted before, but it was sent via email to the admins email address this morning (UK time). I'm wondering if the next poster will be Sayid. Being as we had the clue of John Locke 'DJing' at the first event, and then a poster for Build our World at the second... perhaps there will be references to who the next poster is for at the events? maybeman, yes I was wondering about that too. The sticker in the window entirely unrelated to the rest of the items for this latest poster. However we did have the Black Rock at the Bardot event that was also unrelated. Maybe they are just visual easter eggs for us ? It's pretty cool our blog got that email. I wonder if they're going to give out that print to every first order? I been thinking maybe Sayid would be the next poster too. He was driving the Canton-Rainier van. But it probably is just visual easter eggs not hints of the next poster. We also got an email from someone asking if we could get any of the skateboard decks. I wish we had that much power / influence on TPTB ! I've just noticed that the Build Our World logo in the Johnny Cupcakes shop is different to the one that Sayid was wearing on his t-shirt. The globe is missing from the Johnny Cupcakes logo. Morning! I saw that article also about getting the print with his order! LostArgs is definitely moving up in the virtual world...I see it mentioned in a lot of places and in comments. And we've been getting new posters here....welcome to all! I'm also hoping that there will be "aha" moments in S6 with things relating to the poster campaign. Perhaps the posters will be in the background of some of the shots ! I'm hoping not as that might be a little too contrived. We did not get any new oddly spaced letters with the latest frame did we? Does that mean we have enough to figure what that was all about? Just a thought about "this is it" vs how long it will go on: remember what was said by someone early in the "game" (Paul? or Fake Paul? or someone else? ), that this would make the last half of 2009 fantastic, or something to that effect. Meaning most likely that this will be going on for a while, until the end of the year. I'd guess that TPTB and their Santa's helpers are very clever and will make this "thing" very quirky and interesting until the fat lady sings its end, as the saying goes. Just a warning: It's getting scary out there with casting and filming news! Watch out! I'll bring some dip and little sausages on a stick to the party. Thanks for the warnings Maven...I'm trying to stay away from EW, TV guide, etc. and all sites of the like, but I'm even having to be careful on twitter! 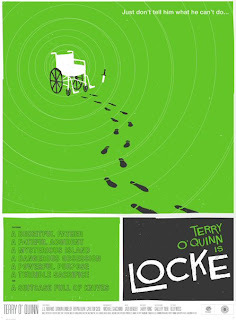 The Locke poster is now sold Out ! and, i know most will relate "part of a bigger ARG" to the "The four Toed Statute is Tawaret" decoding, but what if it doesn't? all about the different puzzles used in the wired mag. what if the wired mystery was a primer on the type of games/ciphers/codes to use here? they are very difficult, which was JJ's point. for example, in the wired puzzel, on the masthead there was a series anagrams with one left over letter within each, then all the left over letters spelled a word. could that be the case with the sawyer's nicknames on paul's blog? they just have to be anagrams, they are too weird otherwise. my gut just cannot accept that there aren't bigger things here. any thoughts? Inna, yes you could be right, I think a lot of what JJ does finds it's way into his products in similar ways. Thanks for that article link Inna! OT: Is anyone following the Truth Hack for Flashforward? He just posted a puzzle leading to encrypted files he anonymously received. I have no idea what do to with his puzzle! Help! I've meaning to get over there today and haven't. Not that I'm any good at puzzles but I'm curious and will take a look. When you highlight the page or double click the squares some of the squares have smaller squares in them. There could be a sequence to them to unlock the locks. I'm in the same boat as you and scoutpost. Puzzles are puzzling. Thanks, guys. I'm going to check out the Red Panda forum and see if anyone's solved it! I'm cheating at this point. 2) A big 4. when you click on it plays a sound. Morning all, it's a slow day at work today. Just dropped my daughter off at school. I'm sure maven will appreciate that. I did think there was something to do with top middle bottom but I thought it went top left right middle middle bottom left right. There's a new clue for frame 3. Other than looking like a puzzle I don't know what it could be. No clue what that is. Question tho: In the pic of the producers and the comedian in the studio, who's the fourth guy, whose back is to us? It is a 2D bar code, I'm just getting it translated now.